The reason why I’m so quick to identify with my Romanian roots is because as a child I had a great opportunity to learn about and experience this part of my background through music, dance, food, and language. 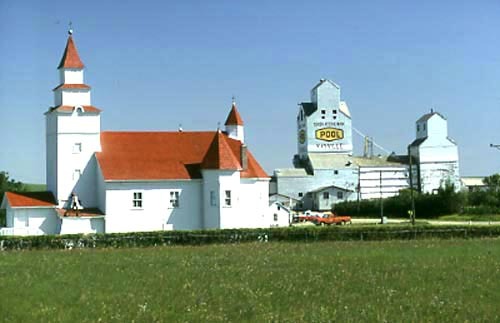 My great-grandparents were part of a group of Romanian settlers who immigrated to the Kayville-Dahinda area of southern Saskatchewan in 1907. They were originally from the town of Rădăuţi, located in northeastern Romania in the historical region of Bukovina. 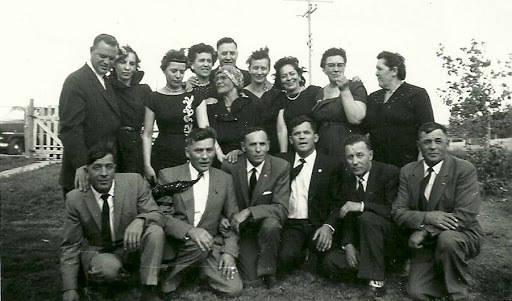 According to the Encyclopedia of Saskatchewan, there was a loss of Romanian identity among the descendants of these settlers for various reasons; however, in 1965 the second generation of Romanian Canadians formed the Eminescu Romanian Dance Group in Regina, Saskatchewan, to help bring their cultural background to life. 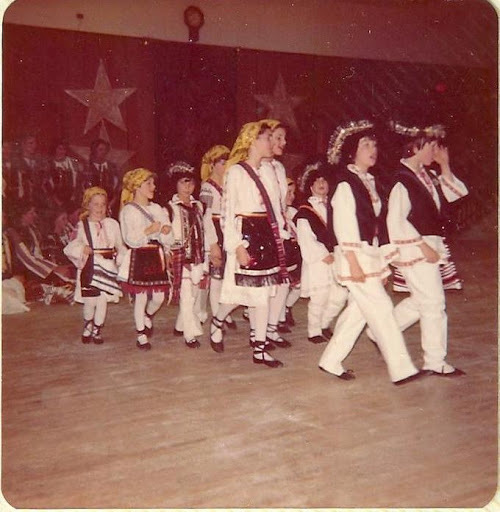 I feel very blessed to be one of the third generation Canadians who got to spend many years of my childhood learning and performing the dances of my Romanian ancestors. We were taught by Maestro Petre Bodeutz, a wonderful instructor and artistic director whose attention to detail and authenticity were impeccable. Each dance was a living snapshot of a different region of Romania. This is a video of my sister and I performing a dance called Zamfirica in 1985 at Mosaic, a cultural festival that still takes place in Regina every year. The senior level dancers were amazing and travelled throughout the world to perform. In this next video from Mosaic 1985, they’re doing a dance that originated in the Mureș Valley of Romania. I have many fond memories of those days. Dancing is a unique art that exists very much in the moment. Dance steps can be mapped out on a piece of paper, but unless a particular dance is captured on video, there’s no real way to preserve the movement, colour, and music that permeate the senses of both the dancers and audience. That’s why I’m very grateful for the skilled instruction of Maestro Bodeutz. He and the rest of the Romanian Canadian Club in Regina helped pass on cultural knowledge that my fellow dancers and I carry with us to this day. And finally, this post is lovingly dedicated to the memory of my Romanian ancestors, especially my Great-Aunt Rose, who passed away on April 30, 2016. She was the last surviving member of the first generation who grew up on the Saskatchewan homestead settled by my great-grandparents when they arrived in Canada. Rose was an avid square dancer, and it is she who told me that her mother, my great-grandmother Agafia, was a Romanian folk dancer herself. I’m proud to have been able to carry on my family’s legacy by following in the dance steps of my ancestors. Previous Article Memories of Closed Captioning and Magnum, P.I. Next Article "Make New Friends but Keep the Old"
That's Beautiful Jena! Thank you. We were a part of the Slovenian cultural club in winnipeg when we were there. I loved the family aspect and the friendships we made were wonderful. Morgan danced for their group in folklorama too. It's sad to leave such a group behind. (Greg was born in Slovenia,so we have some pretty tight roots there!) Even though situated pretty close geographically, I've found the food is quite similar, and I love a good goulash made by my mother in law,no one can beat grandmas perogys and cabbage rolls! Thanks, Janna! I know what you mean about the family aspect. That's exactly what the Romanian Club felt like too. I wish I could have seen Morgan perform with the Slovenian group! Great to see footage of my younger self in '85. Well expressed memories and feelings of Eminescu. Perfectly expressed feelings and memories of the “Romanian Club”. Thanks so much, Andre! The older I get, the more I appreciate these memories. I'm so grateful to everyone at the Romanian Club.